Gore Hill Oval is located at 209 Pacific Hwy. Toilet facilities are available. Parking available. Bus shuttle from Chatswood CBD. Monday Lunchtime – Mixed Soccer; 6 aside soccer, with max. 4 guys on the field. 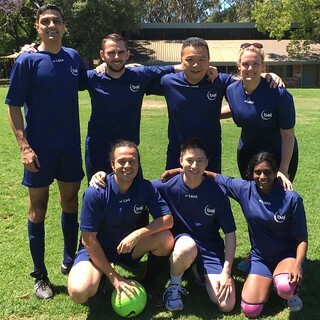 Monday Lunchtime – Men’s Soccer; 6 aside soccer (girls are allowed to play). Monday Lunchtime – Mixed Touch; 6 aside touch football, with max. 4 guys on the field. Thursday Lunchtime – Mixed Soccer; 6 aside soccer, with max. 4 guys on the field. Thursday Lunchtime – Mixed Touch; 6 aside touch football, with max. 4 guys on the field. Lunchtime games are 30 minutes and played between 12:00pm and 2:00pm. * Standard Fee is valid up till the Registration Close Date for the competition . The Late fee is applied to all teams who register after this date. +Anderson Events doesn’t offer refunds for Sports Competitions. We may offer a credit for the immediate season to follow the current season that the team is opting to leave. In all cases, Anderson Events may elect to withhold a $100 Administrative Fee for any Team Cancelations. 1. A social competition against other fun corporate & social teams. 2. A fully set up field with all the equipment provided. Incl. Drinking Water, Sunscreen, Goalie Gloves. 3. We will have Shinguard’s for sale ($10.00). 5. All teams get to play all weeks (no matter where you end in the standings). 6. All rained out rounds will be replayed when possible. No guarantees. However we cannot play at this venue during school holidays. 7. A Venue Manager with First Aid qualifications and a Soccer referee and a Touch Football referee.